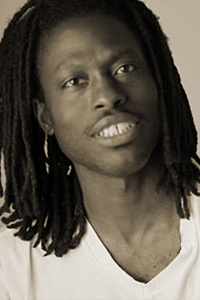 Roger Reeves is the recipient of the 2014 Levis Reading Prize for his debut collection of poetry, King Me (Copper Canyon Press, 2013). His poetry appears in Ploughshares, The American Poetry Review, Boston Review, Tin House, Poetry, Best New Poets 2009, and The Paris–American, among others. He is the recipient of a 2013 fellowship from the National Endowment for the Arts, a 2008 Ruth Lilly Poetry Fellowship from the Poetry Foundation, two Bread Loaf Scholarships, two Cave Canem Fellowships, and most recently a 2014–2015 Hodder Fellowship from The Lewis Center for the Arts at Princeton University. Reeves earned a BA in English from Morehouse College, an MA in English from Texas A&M University, an MFA from the Michener Center for Writers at the University of Texas at Austin, and a PhD from the University of Texas. He is an assistant professor of poetry at the University of Illinois, Chicago.